A true Aussie read that will have you smiling and laughing as you read about show and crow day and the wonders of childhood is the first thought I had as I went to write about The Croc Shock by Sharon L Norris. What would you take to show and crow day if you were a kid? I am sure Grandad’s false teeth in a glass, your collection of stuffed dead cane toads or maybe your best baby saltwater crocodile were the first thoughts you had. This is only the start of what you will find within this Aussie school level reader. 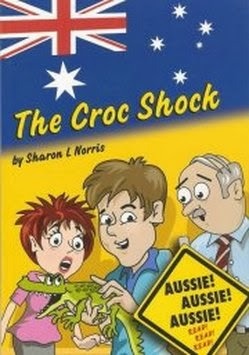 The Croc Shock by Sharon L Norris is part of set 2 of the Aussies School Books series for Australian primary schools. These 100% Australian published and produced books are written by Australian authors and educators specifically for Australian students. I was impressed with the layout and quality of this book, finding it very appealing and inviting. Sharon L Norris has done a marvelous job at capturing the humour that primary students love and using it to encourage a love of books and reading. The black and white cartoon illustrations by Chris Dent add to the fun loving mood of the book. This book is a comical representation of the true essence and uniqueness of Australian life and our wildlife. The Croc Shock by Sharon L Norris is a wonderful early chapter book of 27 pages over 6 chapters. I really can not fault this reader. It is a great size for kids to hold in there hands with my 6 year old being able to easily manipulate the book. Her eyes lit up when she first laid eyes on the book as chapter books recently became her world, sharing one with myself each night. Smooth to hold, pages that turn easy, content that brightens the room and illustrations that make you smile, The Croc Shock left me wanting to explore the the Aussie School Books series from set 1 onward.